Note: The 2020 CAM CE Textbook for the September 30th, 2020 deadline will be available in late 2019. 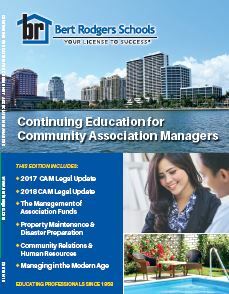 Community Association Managers (CAMs) in the state of Florida are required to complete 20-hours of continuing education by September 30th, 2020. The Florida CAM continuing education requirement includes 4-hours of approved courses in each of the topics: 1) Legal Updates, 2) Human Resources, 3)Insurance & Finance, 4)Physical Property, and 5)Elective credits. Bert Rodgers offers the required continuing education courses needed to renew your Florida CAM license in a convenient online or correspondence textbook format. Since 1958, Bert Rodgers has helped Florida professionals obtain and renew licenses and we look forward to helping you do the same. Please contact our helpful student services staff at 1-800-432-0320 if you have any questions. We are happy to assist. Have you completed our textbook CE courses? Online grading allows students who have received a copy of the Bert Rodgers CAM Continuing Education book in the mail to submit the answers to their exams for immediate grading and results. Upon completion, you will receive a pass slip and a diploma to keep for your records. Our staff will handle all of the necessary reporting of your completion to the state on your behalf making it easy to renew your license. Do you need a copy of the Bert Rodgers CAM CE Textbook? Click Here to request one and we will be happy to send it to you. Do you need to complete CAM Continuing Education Courses? Bert Rodgers online continuing education courses are designed to be easy to complete and are filled with useful information relevant to your CAM career. Upon enrollment, you will have instant access to the course material. Our staff and instructors are available to support you throughout your course in the event that you have any questions. A pass slip and diploma will be issued immediately following your course completion, and our staff will handle all the reporting of your education to the DBPR on your behalf. At Bert Rodgers Schools, we make your CAM continuing education one less thing to worry about.